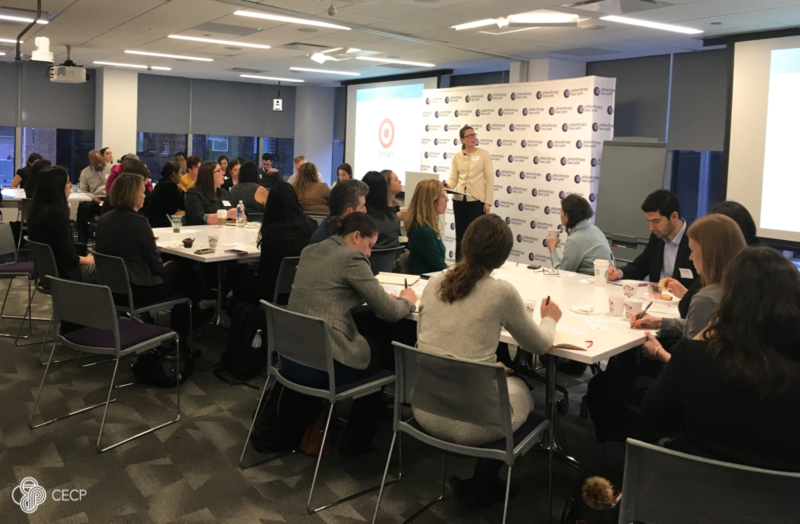 Hosted in partnership with Philanthropy New York, Service for Impact convenes corporate grantmakers and volunteer leaders to explore ways to create an impact in the community and support business objectives through volunteerism. Launched in the spring of 2009, Service for Impact was formed in response to President Barack Obama’s call for Americans to integrate volunteering and community service into their lives. Funders in New York established a community that hoped to expand volunteerism and improve lives throughout the New York City metro area. Jennifer Weston-Murphy of CECP’s Corporate Leadership Team sat down with Service for Impact Co-Chairs Matthew Nelson, Corporate Vice President, New York Life and Lalita Badinehal, Director of Grantmaking, Credit Suisse Americas Foundation talk about what Service for Impact aims to accomplish and how the employee engagement field has evolved in recent years. Jennifer Weston-Murphy: What makes Service for Impact unique? Matthew Nelson: Service for Impact is unique in so many ways. It brings together corporate citizenship leaders to discuss ways to create powerful volunteering programs. In our individual companies where there are very few people focused on this work, we can’t walk down the hall and ask a colleague about volunteer strategies. We are it. Service for Impact serves a unique role as a community for peers in this space to learn from each other, as well as to connect to the latest trends and best practices in the field. Lalita Badinehal: What I appreciate so much is how committed the community is to going beyond the tactical aspects of implementing an effective volunteering program. An important part of our conversations is focused on what must change to evolve the perception of corporate volunteering from a “nice to have” to a “need to have,” and eventually to a transformational resource to companies. For example, rather than companies engaging in pay-to-play volunteering, Service for Impact encourages dialogue on how volunteering can be a strategic piece of an overall corporate citizenship strategy to maximize its impact in both the community and in the corporation. JWM: How has corporate volunteerism evolved? What sets apart the best volunteering programs? LB: Looking back at the last 10 years, it certainly seems like corporate volunteering has become a more important and visible piece of a company’s multi-faceted approach to engaging with their communities. More companies have embraced and supported it, and today, most employees expect a company to offer some sort of volunteering program. The focus on skills-based volunteering continues to grow in its many forms including pro bono, nonprofit board service, virtual volunteering, “micro-volunteering,” and immersive skills-based volunteering assignments outside the employees’ home base. Volunteering programs at companies can be quite different, so it’s hard to evaluate them, but the best ones: (1) meet both a societal and business need in an authentic manner and (2) have a way of measuring and articulating the social and business impact clearly to ensure they have resourcing to continue running these programs. Let’s take nonprofit board service as an example. Not only does an effective nonprofit board service program enable employees to contribute their professional expertise, but it also gives them the chance to use their leadership skills in new ways—and even acquire a new set of tools that they can bring back to the office. You can quantify the business and social impact of nonprofit board service in several ways: measure the leadership development as well as the retention and engagement rate of employees who serve; and assess the impact on the nonprofit’s resource base and its ability to meet its goals. Read the full interview on CECP Insights Blog here.